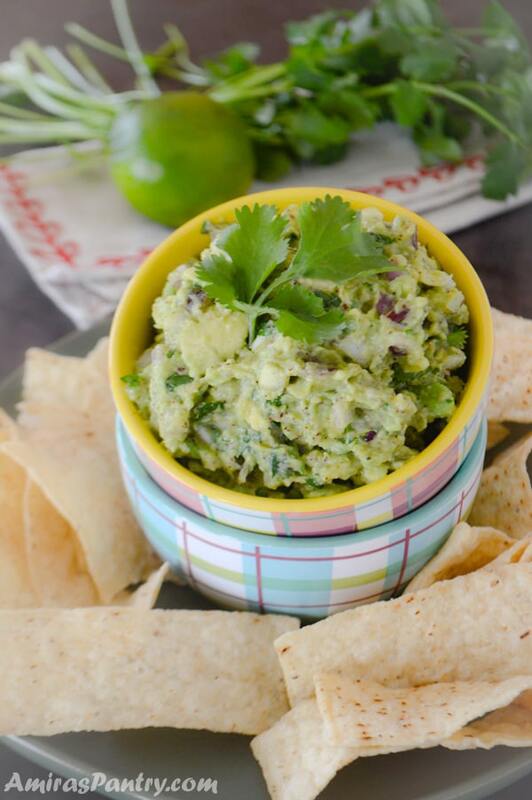 Want more dips? 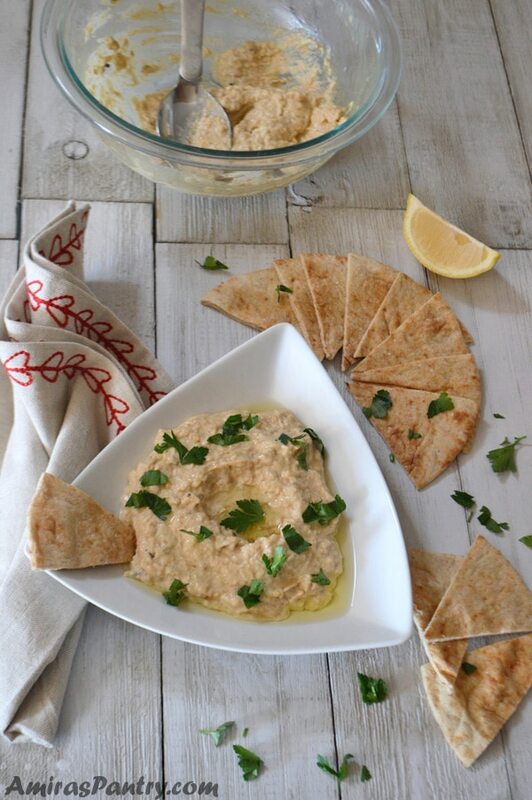 try this creamy rich and authentic hummus recipe. This recipe has been updated from the original December 2016 version in order to provide a better experience for our readers. 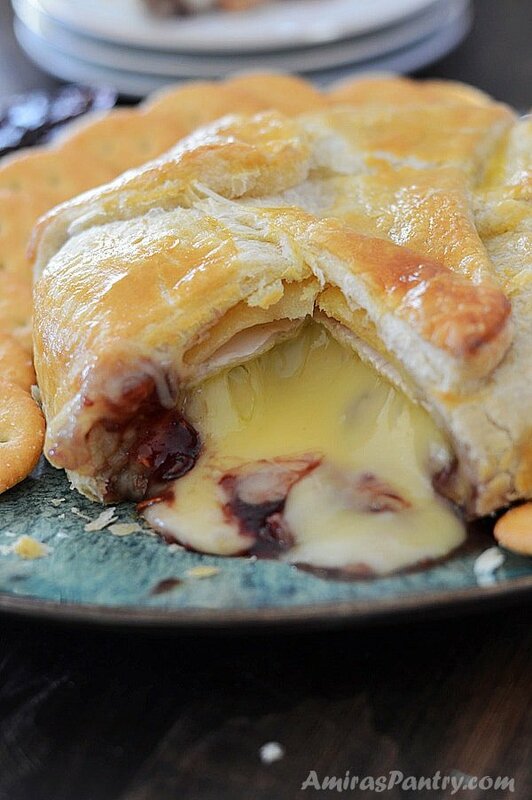 Baked brie buff pastry recipe is an appetizer you can prepare ahead of time and bake with you are ready to serve. 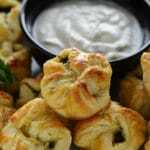 This is one of the most enjoyable appetizer during the holiday season. Brie is stuffed with raspberry preserve and some pecan for a crunch factor then wrapped in a puff pastry blanket and baked. So delicious. Are you hosting soon, or may be invited to a party where you want to bring a homemade impressive and stunning dish?. 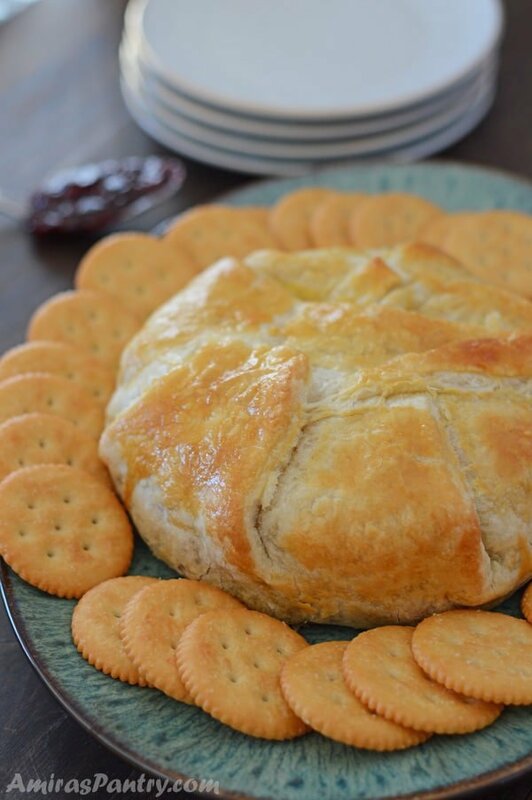 Sinful and great recipe for an easy baked Brie that can be an appetizer or a dessert – either way, for the amount of effort it took, this is gonna be a big, big winner. I am so excited to bring you this recipe that was very well received. Sweet and savory appetizer at its best. An appetizers for you party that is ridiculously easy and looks very rich and fancy. It is so creamy and super delicious as well. How long do you bake brie? I baked mine at 400F oven for almost 30 minutes. You can also bake it at 425F for 20-25 minutes. First, place the brie in the freezer only 30 minutes. We do not want it super hard, we need to give it a good chill to set it up for easy slicing. Just place it in the freezer while the puff pastry is thawing. Then roll out the puff pastry, put the Brie wheel on top and slice it in half. For the PRESERVES – Don’t hold back. I’ve used about half an 18 oz. jar , it tasted SO good although I felt it still needed more. For the nuts – Yes, yes yes! It tastes way better with nuts, anything that you like. I personally like adding shaved almonds or chopped pecan in between the sandwiched halves of brie and preserves. You’ll love it! To keep the brie from leaking you need to brush each fold you make with the pastry dough with egg, egg acts as glue for your pastry dough. Spraying your pan with oil -and even lining it up with a foil then spraying it with oil- before putting the brie down helps reduce residue on the pan. For this recipe pictured here, I’ve used raspberry preserve, my other recommendations are peach and apricot, they pair very well with brie and almonds as well. 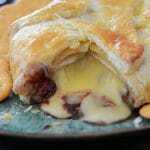 What Other variations for Bake Brie Buff Pastry? 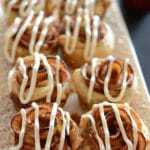 If a sweet wheel is not your thing, try a savory twist. Caramelized onions, jalapeño slices, may be garlic and sun dried tomatoes, who knows, this might be your thing. 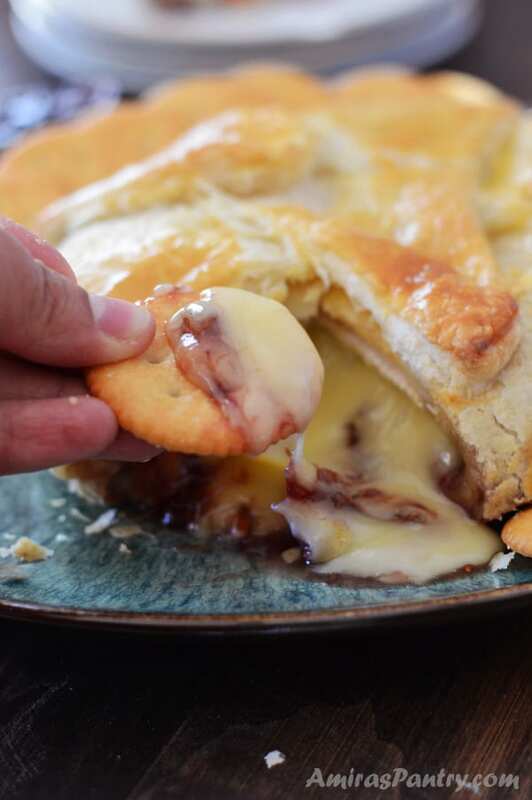 This is a very basic recipe for a baked brie with puff pastry, do not stop here and let your imagination go wild with all the possible flavors you can add. Serve on a tray with fruits like berries and grapes. It is really so delicious with whatever. 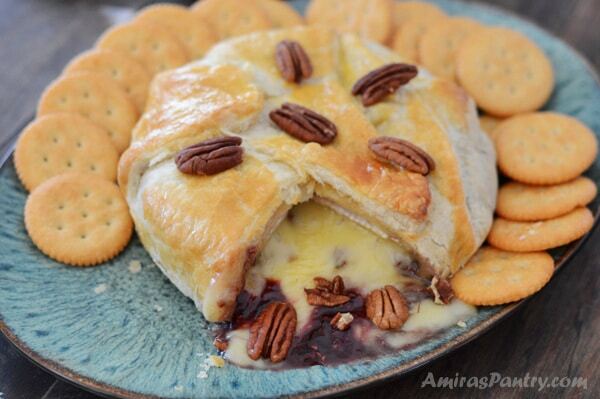 What is your favorite variation for a baked brie wheel? 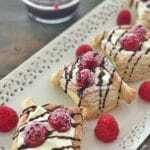 1 sheet of puff pastry 1/2 a package. 6-8 oz raspberry preserve more or less depending on your liking. Roll the puff pastry, Place the cheese on top in the middle of the sheet. Slice the Brie in half. Spread the raspberry preserve then top with chopped pecan. Bake for 30 minutes or until the buff is golden brown. * I place the Brie in the freezer just to firm up not to be completely frozen. This way it is easier to slice in half. ** It is extremely important to brush each fold of the puff pastry with egg to seal the cheese inside and prevent it from leaking to your oven pan. *** You might as well line your pan with foil then spray the foil. **** I highly advise you to let it cool for a 10 to 15 minutes before serving it. This gives the melted cheese just a little time to firm up — it will still be gooey and scoop-able, but no longer molten lava burning mouths. Always popular at a party. 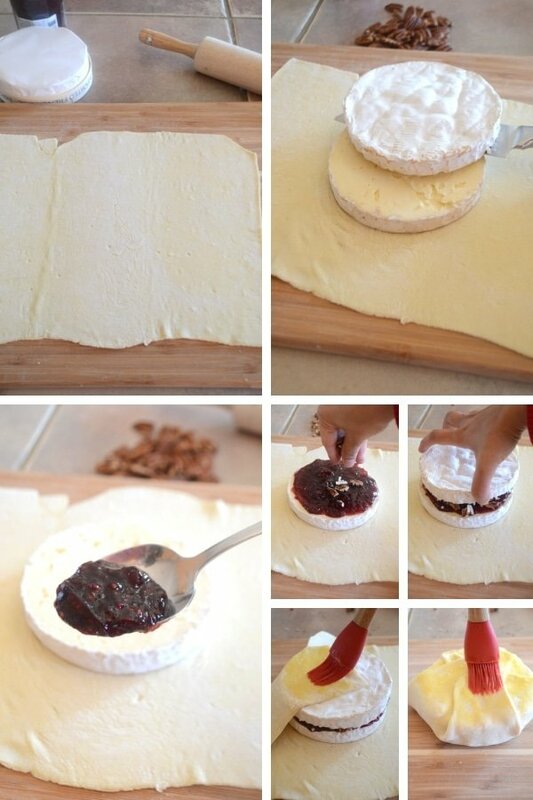 I like the way you put the jam and nuts in the middle of the Brie. I hope you’ll have the chance to make them again, happy holidays :). Love theis cheesy treat for the holidays and way better to make your own, love the recipe. Happy New Year Amira!